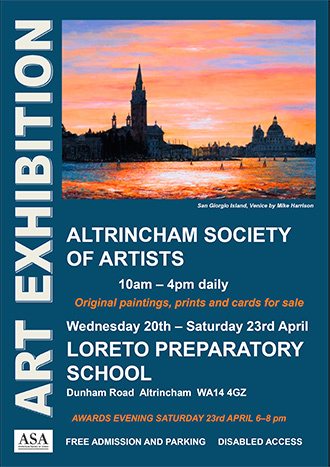 Established in 1937, the Altrincham Society of Artists aims to provide local artists with an outlet for their creative energies. With membership numbering over 150, the aim of the Society is to stimulate interest in drawing and painting in a variety of media. The Society is not primarily a teaching Society and therefore we encourage those who are interested in joining us, first to gain some knowledge of, and acquire skill in, at least one chosen medium. A full winter programme, between the months of September and April, enables members to participate in studio sessions, workshops, demonstrations and social events. In the summer months there are opportunities to join in the outdoor sketching and participate in a two/three day painting weekend. Society events usually take place in The Studio, Sylvan Grove, Altrincham WA14 4NU. Indoor exhibitions take place in the Spring and the Autumn and smaller outdoor exhibitions are arranged whenever possible. Spring Exhibition Saturday 6th to Wednesday 10th April 2019. Please come and visit our autumn exhibition, original paintings, prints and cards for sale. Exhibition opening times 10am to 4.30pm each day. Art demonstrations daily, please see details below. Free Admission Parking Disabled Access.